Forum Promoter Kawal Pilkada Demi Indonesia yang Lebih Baik di Hotel Amaroosa, Jakarta Selatan. INDUSTRY.co.id - Jakarta - The Indonesian National Police (POLRI) is ready to maintain security and smoothness during the elections process from the beginning to the end, especially ahead of the announcement of the winner of Regional Head Election. This was expressed by Karo Divhumas POLRI, Mohammad Iqbal, Thursday (19/7/2018) in the Promoter forum "Pilkada Pilkada Demi Indonesia Better" at Hotel Amaroosa, South Jakarta. According to him, Pilkada is indeed vulnerable to conflicts to splits due to various factors. Among them political parties supporters or bearers of all candidates have different interests. In addition, there is a non-neutral person from the election organizer. Usually occurs in KPUD, Panwasda, Panwascam, State Civil Apparatus and Security Apparatus. "Conflict also occurs because of the intent and purpose to pursue the interests of Pileg and the 2019 presidential election and also not yet the formation of permanent coalition by the political party bearer either at the central level up to the regional level," he said. 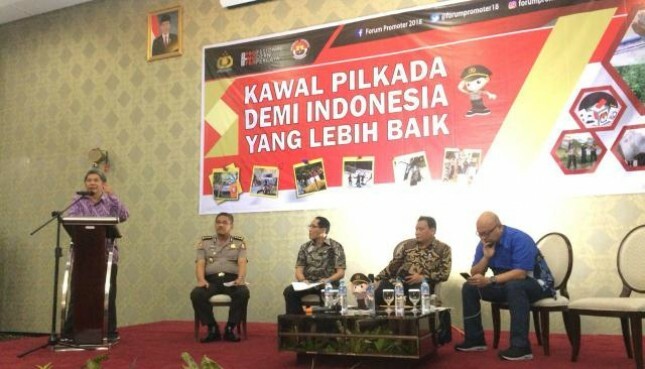 Meanwhile, Chairman of Bawaslu, Abhan, said it has received complaint reports related to the implementation of elections as many as 1176 cases and findings of alleged violations of 2,400 cases. Total records of Bawaslu on reports and allegations of violations were 3,567 cases. In order to minimize violations in the future election, Bawaslu hopes that the active role of the community will be able to report if it finds a violation committed by the organizer or the candidate pair of regional head / DPR / President. The objectives of participatory oversight that Bawaslu encourages are to make elections more integrity, prevent conflict, encourage public participation, improve democracy and shape public awareness in politics.